Serve these tasty potato nachos on game day with bowls of additional toppings so guests can load their nachos up the way they like them. More cheese? Yes please! 2.5 lbs (3) baking potatoes, skin on, large, approx. Cut potatoes into 1/4 inch (0.5 cm) round slices and place in large bowl. Add olive oil, chili powder, salt, granulated garlic, cumin and cayenne pepper; toss until potatoes are well coated. Arrange on prepared pans in single layer. Roast for about 40 minutes or until cooked through and golden brown, flipping half way through and rotating the pans. 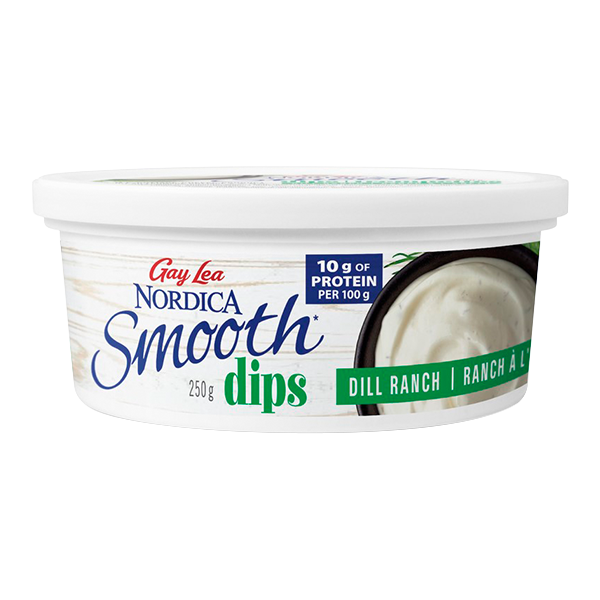 Meanwhile, in a small bowl, stir together Nordica Smooth Dip, jalapeño and garlic; set aside. When the potatoes are ready, remove from oven. Place all the potato slices onto one pan. Scatter cheese, black beans and green onion evenly over potatoes; broil until cheese is melted and bubbling. Drizzle some of the dip mixture over the potatoes and scatter on your favourite optional toppings (if using). Serve immediately with extra dip on the side. Kick up the heat! Make the dip the day before and refrigerate - it gets zestier overnight! Use Ivanhoe Jalapeño Goat cheese in place of cheddar cheese.